Airprint is a technology which is designed by Apple that lets users to print a variety of documents instantly from iOS devices (iPhone or iPad) wirelessly and without having to use any softwares or additional drivers. In the initial release, Airprint feature is only compatible with some HP printers but over time, there are many printers from different brands support this feature. Although there are several other alternatives to print documents from iPhone or iPad (install additional apps) but trust me.. Airprint is is the most convenient and simple way that you can use, as long as your printer has supported this Airprint feature. 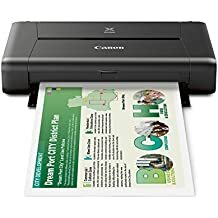 Has more than 4.600 reviews in Amazon, this Airprint-enabled printer has become a favorite of many people in the world. You can print wirelessly, without having to download any drivers or use router at all, just print directly from your iOS devices (iPhone, iPad or iPod touch). It supports duplex Printing where you can quickly print text or images on both sides of the paper. If you are looking for a good photo printer so you can print all photos from your phones, then you can consider The PIXMA iP110 from Canon. With it, you can easily produces high images quality, resolution of 9600 x 2400 dpi and paired with 1pl technology. Your photos will look very professional and gorgeous. All in all, it is an awesome printing solution for business professional. The Brother MFC-J870DW is an Inkjet wireless printer for home or small business use. It allows you to print up to 33 pages per minute (for black) and 27 PPM for color with resolution of Up to 6000 x 1200, supports wireless feature and mobile printing too (including Airprint). If you are looking for a good wireless printer for your business or small office and can be used to print multi-page reports, excel documents, invoices, etc, you can consider to have the MFC-J870DW. The HP Envy 4320 is a multifunction printer that allow you to scan, copy and print documents from a single machine. It brings complete wireless solution and you can easily print from your Mac computer from anywhere around your home using WiFI certified or directly print from other iOS devices like iPad tablet or iPhone via Airprint. For easy operation, this printer has been equipped with 2.2 inch LCD and touch panel. It has 1 USB port for easy connection to any computers. The Brother MFCJ450DW wireless all-in-one printer give you a freedom to make connection to various mobile devices (including Apple, Android, Amazon Kindle, BB, and so forth). It also comes with Brother Cloud Apps that you can access from the printer using its touchscreen display, 2 sided printing helps save more paper and can be operated in “Ink Save” mode so the use of ink can be reduced. Another great Airprint-enabled printer by Canon, the PIXMA MG7520. In addition to mobile printing, this unit also packed with cloud printing function which lets you print from various online cloud services like FB, Twitter, Google Drive, Dropbox, etc. Also, it allow you to prints photos beautifully from high-definition movie clips, while borderless photo with size of 4″x6″ will be printed in about 21 seconds. When you print via memory card slots, you don’t even need to turn your computer ON. The HP Envy 5660 is a multifunction printer but without Fax feature. It allow you to print or scan documents to USB and external sd card. The device comes with 2.65-inch color touch screen and packed with various web applications like HP forms and calendars, Dreamworks, etc. Just register in HP official websites for HP’s ePrint service. Also includes auto duplexer, 25-sheet ADF, supports HP mobile printing and airprint of course. This Inkjet printer offers fast print speeds for your home office and easily print from your smartphones and tablets. Works wirelessly and has 4 individual ink cartridges so it will be easier for you to replace the color you need. Print speed is 9ppm for black and 4.7ppm for color. Most users said that it is easy to install and ready for use within minutes. Fax feature is also included where you can send documents directly to or from your computer. Here is an excellent printer from Epson, the WorkForce WF-3620. Using this printer means save more time because it can prints in professional quality, speed reaches 19 pages per minute (black) and 10 ppm color. In comparison with color laser, you can also reduce the printing cost up to 40 percent. A variety of cool features can be found in it, operating will be more easier because it uses touchscreen technology (2.7 inch). Multiple connectivity options are available, wireless & Ethernet networking as well as Wi-Fi Direct. and the last one, we have WorkForce WF-640 by EPSON. It’s engineered for business purpose. According to some users, the installation is simple because it’s equipped with excellent instructions. This may not be a good printer for printing photos but in case you are searching a home office printer with high-efficiency features like wireless printing (direct or Airprint support), ADF, duplexer and affordable ink cartridges, then this printer can be perfect for you. Which type of Airprint printer is the best for you? Inkjet : The Color inkjet printer have been used in many homes, small business or office, etc. You can print anything using an Inkjet printer ranging from graphics, pie charts, photos, essays, web pages and so forth. There are a variety of airprint enabled Inkjet printer out there and most printers have great quality and versatile. Laser : Color laser printers usually used by big companies and often found in businesses. The best part is, this printer is perfect for those who want print large amounts of text quickly. All in all, its faster than Inkjet and outputs will be crisp and sharp. USB port: All good quality AirPrint printers will have at least a USB port that allows them to connect to both Windows and Mac computers. Wireless : When an airprint printer has been equipped wireless feature (works via Bluetooth or WIFI network), you can connect then print documents from your devices wirelessly. Some airprint printers also come with PictBridge feature that allow you to connect a digital camera to your printer directly. It’s easy to download and print from memory card of a camera. Memory card reader: You can also find airprint printers with built-in memory card reader.. This feature allow you print documents or images quickly from compatible digital camera or othe external media without having to use a computer at all. LCD viewer : With a LCD display, users can manage all functions of an Airprint Printer easier. With it, you can also view on the screen your edited images on memory card before print them. Ink monitor: Most high quality inkjet printers usually comes with an ink monitor feature, when the ink is getting low, you will get an alert. Internet connectivity : Many Airprint (multifunction) printers are able to communicate to the Internet so you can print online contents. Some printers can send print jobs via email using Email Printing feature. Automatic Duplex Printing : This feature allow users to print on both sides of paper automatically. It’s mean, you can save more money, paper and time. That’s it .. now you have an idea about how to choose the best printer for your needs.